Hey there! We’ve been wanting to send out this update for a good while now, but we needed a couple of things to line up as you’ll see below. Thanks for your patience! We’ll get straight to it. Heart Forth, Alicia will not come out this year, with our current projections taking its development well into 2018. A good amount of main game content is at a finished state by now, but several key sections still remain under different stages of development. This remainder is scheduled for completion during that time, with a more considerable amount of side-game/optional content to be developed after it, which includes some of the stretch goals and creative content. The first is the sheer amount of content and effort that a project of this size demands. We’re a small team working to bring a complex and ambitious game to life, and even as I’ve involved people I trust to expedite specific parts of development, in many ways this is still a single-man project that needs its due time to come together as intended. Long before we brought the game to Kickstarter, we committed to side with quality and not rush things out. We believe this is what made you interested in the project in the first place, and is likely what prompted your generous support. We’re aware that delays are rarely seen as good news, but we’re confident that our commitment to quality is what will make Heart Forth, Alicia a worthwhile experience for you in the end. The second reason is that the tools we use to make the game come with inherent limitations that we can’t escape from, and which are part of our development cycle. Talking about tools, processes, or detailing our whole workflow is hardly exciting, but the takeaway is that sometimes these limitations require us to invest extra time on certain processes. While predicting when this will happen is not always possible, we’ve grown accustomed to these limitations, and we’ve become adept at mitigating them. Even then, they do add to the project’s development time. The third reason is that earlier this year I ran into a health episode that I took as a wake up call. Extended periods of sitting down and working unhealthy hours had taken a toll on my body, and I was warned that things would get serious if I didn’t change course. I still continue working on HFA seven days a week, but under a reasonably healthier schedule. This necessary change of pace was also reflected in our timeline adjustments. It’s not unheard of that games may sometimes take longer than anticipated, and that can be a source of frustration. We’re focusing on making Heart Forth, Alicia a memorable journey, so the quality we want the end result to have has always factored into our decisions. That said, the team and I share in the frustration some of you feel for wanting to have a finished game in your hands by now. We’re aware this is not the first time we’ve announced a delay, and for that reason I feel a great weight in my heart not being able to bring a finished game to you yet—including to those of you who’ve been following this project long before the Kickstarter campaign. You made this game possible, and our commitment to you remains unwavering. As we continue working tirelessly to get to the finish line, we want to avoid any further disappointments caused by inaccuracies with our release projections, so we will not be setting a targeted release window for the time being. We’ll continue working ahead and come to you with a release window further down the road, once our efforts bring us to a concrete and final timeline. We’ll continue keeping you updated on the game’s progress all the way up to its release, and we’ll make sure updates roll out on a regular basis. Keep an eye out, too, for the weekly development livestream every Tuesday at 1pm CT. I’m always available to discuss any questions, suggestions, comments or criticism you might have. Even if you can’t make it to the stream, you can still check out the recorded VODs to stay in the loop. We’re deeply thankful for your patience and your trust. Considering a good amount of time has elapsed since the end of the campaign, we want to give all backers a free reward: a vertical slice of the game. As of this moment you have access to the “All Backers Demo”. Head to your profile page in the Backer’s Club, and click on the “Sign up for Demo Access” button. The demo is available on Windows and Mac versions. If you haven’t yet claimed your Backer’s Club account, click here to send yourself an invite. 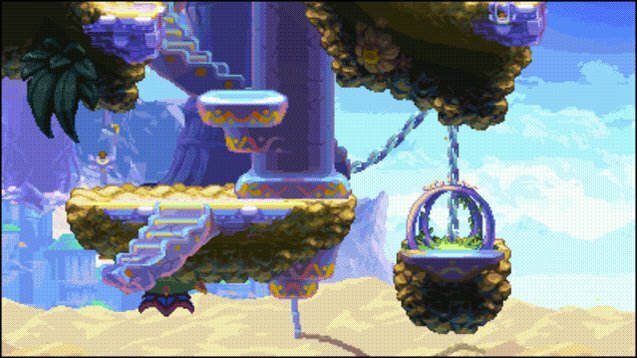 We’re sharing a section of the game that will give you a good taste for the final game, including our classic action & metroidvania gameplay, the exploration of the first dungeon of the game, its fun combat mechanics, its tricky puzzles and an epic boss fight with a menacing fiend named Sceadu. 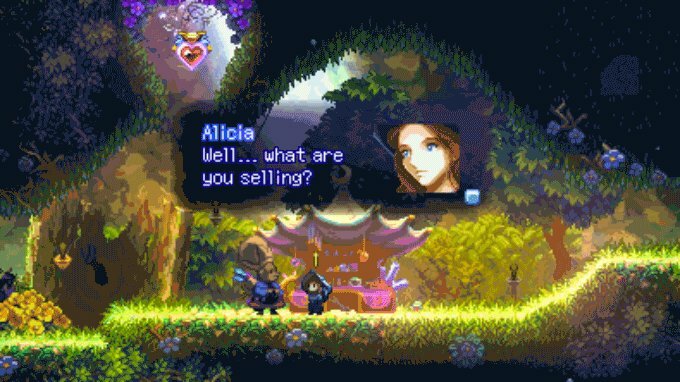 As you know, the story is a core part of Heart Forth, Alicia. We intend to keep it under wraps until the final release, but there’s just enough story here to get your imagination going. You’re welcome to broadcast or livestream your gameplay, only make sure you follow the rules in the terms and conditions to avoid any penalties (the rules will be emailed to you, and you can always re-read the rules in the downloads section). We want to take this opportunity to know what you think of the game after you’ve played it. Share your thoughts on the comments section below, or even better, come join the dialogue on our weekly Twitch livestream on Tuesdays, and/or our Discord server. Finally, thank you again for your continued support. What platforms is this still in development for? I’m presuming not Wii U anymore…? Acabo de jugar el demo y debo decir que toda la espera está valiendo la pena. Con lo poco que jugué, tuve una experiencia que hace tiempo no tenía en un juego. Como bien dicen “Haste makes waste”. ¡Ánimo y felicidades por el trabajo! Come on, it’s been 10 years now…not that another year makes much of a difference now, but honestly, I’m getting really tired of reading all those excuses all the time. I’m still really looking forward to the game, but it’s come to the point where I stopped caring. First time visit here since 2+ years just because I stumbled upon the page cleaning up my bookmarks and still all I read are excuses. Really sorry for your health state, I hope you get better soon. Why not work a little less and clearly aim at a late 2019 release date instead of keeping up with the constant apologies? People will only get angry by those. @Zachary We’re still coming out on Wii U, but the Switch is another console we’d love to port the game to. If/when we have news to share about such a port, I’ll post about it here. @Daniel ¡Gracias! Me da gusto saber que te gustó jugarlo. @SorryMate Feeling empathy for backers or fans who want to play the game is not apologizing or making excuses. The above is a report on development & the things that inevitably happen as we move forward. It’s fine to let out steam. Games are hard to make and, like anything that’s worth something, it takes time to make them. It doesn’t matter how long it takes to make the game, there will always be other games to play until then and anyone that makes you think you have to rush or one more year will ruin everything should stfu and go play something else till then. Your health and the overall quality of the game takes priority, you don’t want to be another No Mans Sky or the countless other rushed and ruined games out there. Stay healthy and make the best game you can. Take all the time you need to create and polish the game. i cant wait to see everything this gem has to offer but i would rather get a delayed masterpiece than a rushed mess of bugs. Merry xmas to everyone involved in the project! !